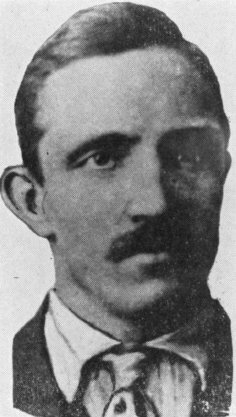 On this date in 1918, German coalminer Robert Prager was lynched near Collinsville, Ill., for making disloyal utterances against the United States as his adoptive country entered World War I. Basically the most visible and famed victim of patriotic anti-German bellicosity, Prager ironically is rather difficult to reconstruct as an unambiguous anti-war activist. After his mob execution, a baker would even come forward to say that he had been thrown in the clink when Prager accused him … of badmouthing a patriotic display. Prager himself had tried to enlist in the Navy and been rejected for medical reasons. But he was a socialist, and a German, and seems like the sort whom others might have found personally unpleasant. It is in the midst of a tiresome local dispute with a union leader (the union also rejected him) that Prager came to the unwelcome attention of the rabble: the union leadership accused him of being a spy, which led Prager to post handbills around town denouncing this lot for their scurrilous accusation. This obviously did him more harm than good and as the public conviction that Prager was disloyal took hold, it overran the halfhearted efforts of the town’s putative authorities to keep a semblance of order. A mob on April 4 captured Prager at his home, paraded him, made him kiss the flag — momentarily rescued and hustled off to jail by police and a mayor who tried to talk the mob out of its design — then shanghaied from his “protective” custody cell and taken to the outskirts of Collinsville for hanging on a tree. Eleven men stood trial for the affair over three weeks. Once the matter was finally rested with the jury, they were instantly acquitted. There was a peculiar coincidence at the trial Saturday. The Jackie Band was in Edwardsville for a patriotic demonstration. When a shower of rain came up the musicians were sent to the court house where it had been arranged to give a program. At 2:40 o’clock judge Bernreuter ordered a recess after the completion of arguments and before reading the instructions. Then word was sent that the band might play until court re-convened. The first number of all concerts is the Star Spangled Banner and it was played Saturday. The strains from the Jackie Band caused tears to flow down the cheeks of Riegel. He was still crying when he returned to the court room. While Prager’s murder stands as the most emblematic event of anti-German intimidation during America’s months in the Great War, it was far from the only one: many others nearly as ugly stopped just this side of homicide. Papers were rife with reports of German immigrants being made to kiss the flag; clapped in jail for suspect utterances; of being menaced by mobs. Outrageously, Germany made propagandistic use of these events, which the virtuous Entente powers would certainly never do. Washington Post, April 11, 1918. But the right-thinking potentates of the war party were also finding themselves relieved that a polity which had re-seated the current president on the slogan “he kept us out of war” would so pliably turn towards bellicosity. This charade so mechanically familiar in our time was still an arcane and uncertain art in America’s imperial adolescence. The question whether or not the laxity of the laws against treasonable utterances has been responsible for the people’s acts in taking the law into their own hands has been much debated of late. While sedition may have been encouraged to some extent because of the comparatively mild risks involved, it is quite probable that the pro-German intrigues would have been carried on if the risk had been greater. This suggests the thought that other reasons must be looked for to account for the general revulsion of public sentiment against the treason spreaders and the prompt punishment meted out to them in so many instances. A plausible explanation is found in the fact that the open and ingenuous American mind had been fed up on German lies to the point where it broke out in fierce revolt. At the beginning of the war, and even after the entrance of America into it, there remained debatable points in many minds. Though of a minor nature and scarcely affecting the larger issue, these points were emphasized by enemy agencies which had been at work from the beginning. But as the truth has been laid bare the indignation of the people has grown stronger. The fact that the rounding-up process has been most vigorously conducted in the middle West tells its own story in this respect. It was that section which was slowest to wake up. There the enemy propaganda apparently worked with most success. So it is there that the people have arisen unitedly in their righteous wrath against the treason talkers. The comparative absence of outbreaks of this character in the East is explainable on the same theory. In the East the public mind toward the war was much earlier divested of errors. Consequently the enemy agents were more wary in their utterances, not because of any greater stringency of the law, but because of their appreciation of the temper of the people. In spite of excesses such as lynchings, it is a healthful and wholesome awakening in the interior part of the country. Enemy propaganda must be stopped, even if a few lynchings may occur. The people know what they want. They are not seeking to subvert law and order. Other powerful institutions were not quite so sanguine as the Post: the lynching was discussed hours after it occurred in the U.S. cabinet, no doubt mindful that it was also being denounced in the German Reichstag. And indeed all concerned marshaled these animal spirits of the populace towards killing men by the thousands under the auspices of the state rather than singly by drunken small-town mobs. Fears of German reprisals against American prisoners never seem to have materialized; neither is there any other documented lynching in the short course of America’s World War I involvement that was conducted on unambiguously “patriotic” grounds. * Any number of other papers joined the Post in this campaign, including the St. Louis Post-Dispatch and the Chicago Tribune. A few weeks later, they got their wish — the Sedition Act, under which the Socialist Eugene Debs was arrested for speaking against the war. If his name was Pragersky, CNN and MSNBC would’ve expected something a little less conciliatory.